One Baltimore theatergoer shouted, “Heil Hitler! Heil Trump!” during an intermission of the national touring production. As 2018 draws to a close, TheaterMania looks back on some of the most jaw-dropping stories of the year. 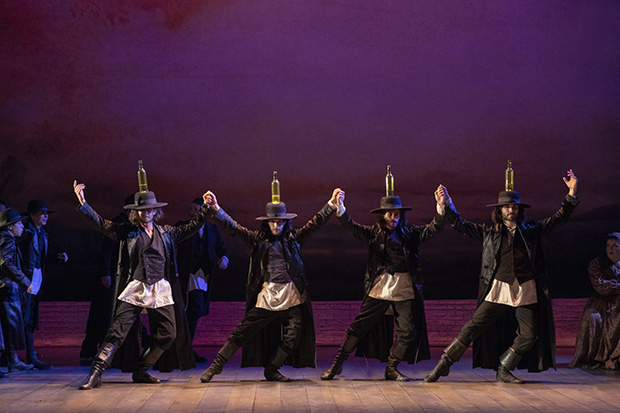 The bottle dance from the national touring production of Fiddler on the Roof. Derlunas was promptly escorted from the Hippodrome by security, served by police with a “stop ticket” (carrying no fine), and told by management that he was banned from the venue for life. Sick, sad world. A man stands at intermission of tonight’s performance of Fiddler in Baltimore and yells, “Heil Hitler,” along with pro-Trump references. Reporters caught up with Derlunas in the following days, and he insists that he isn’t a Nazi. Rather, he claims that he was inspired by the first act finale (depicting a Jewish wedding interrupted by a pogrom) to compare the Nazi führer to the current President, whom he claims to dislike. He also explained that he was quite drunk at the time, and didn’t anticipate the hostile reaction of the audience. “I’m so disgusted and upset with myself,” he told WJZ’s Mike Hellgren.Readers may be skeptical of his theatrical mea culpa, especially when open expressions of anti-Semitism have become distressingly commonplace. More frightening is the prospect that the public cry of “Heil Hitler” could be the overture to an act of terrible violence, an understandable assumption in the age of mass shootings (including the one at Pittsburgh’s Tree of Life Synagogue, which took place just weeks before this incident). Luckily, this seems to be just another case of a drunk behaving badly in public: not nearly as shocking as an actual Nazi paying Broadway tour prices in order to intimidate the audience, but unpleasant nonetheless. May the Lord protect and defend you from such antics the next time you attend the theater. Previous Post Is China getting too close to Israel?